To be accepted for membership of the PRCA, your consultancy must have been in operation for at least three years and principals must agree to abide by a Code of Conduct. 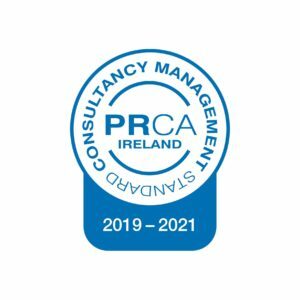 The PRCA believes strongly in developing and measuring the standards already apparent in Irish public relations and to this end have introduced a quality standard model – the PRCA Consultancy Management Standard (CMS). All member organisations will in future operate to this internationally recognised standard, highlighting the high levels of professionalism our members have achieved and also demonstrating to the marketplace that PRCA membership is a genuine mark of quality. As a result, passing the CMS audit has now become a requirement of PRCA Ireland membership. Holding the Standard demonstrates quality assurance to clients, employees and other stakeholders. It is the only such Standard for Irish communications consultancies and is only available to PRCA members.